for details in your area!! Bucking Bronco Rodeo Bulls for Hire and More!! With many years in the business we have built up a reputable, professional & reliable status, supplying Rodeo Bulls across the country. 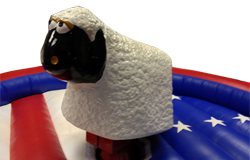 Our top of the range bucking broncos are sited within an inflatable arena and operated by our friendly, professional staff will be the highlight and centrepiece for any event; hen nights, stag parties, birthday celebrations, corporate events, or simply an excuse to have some fun. 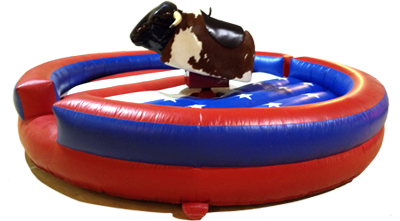 Let the wild west come to you with our mechanically operated bucking bronco rodeo bulls. Make your party even more memorable. 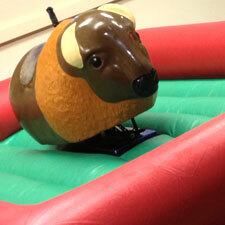 Kids will love Buffalo Billy, our baby bucking bronco. 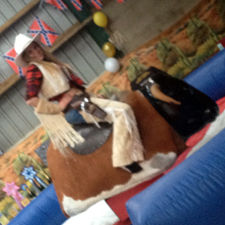 Allowing small children to experience the rodeo bulls and Great for children's parties. How's your balance? 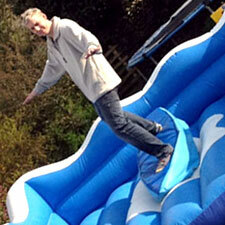 The hilarious surf simulator will have your guests rolling with laughter as the waves get stronger and stronger. All our equipment is tested annually and checked by our staff before every event to ensure everything is up to standard and safe. We have a full Public Liability Insurance to the value of £5000000. Please check our safety page to see our certificates. A back-up plan is always in place for events to ensure everything runs smoothly. Please be assured that we will do our very best never to let any of our customers down. Such plans include; alternative vehicles should one of ours fail, Spare equipment in case of damage, and standby staff to cover last minute absence. Please have a browse of the webpage and contact us for further information. Please note the prices stated are within a 10mile radius of our location please contact use for a quote or see the delivery charges page. All Prices exclude VAT. Our registration number is 172 2959 05.